It’s happening again: blood is in the streets. And if you remember the timeless advice of Warren Buffett, you know what to do: be greedy. Because this selloff shouldn’t be happening (I’ll show you why in just a couple paragraphs)—and as a result, there are plenty of extremely undervalued bargains just waiting to be snapped up. 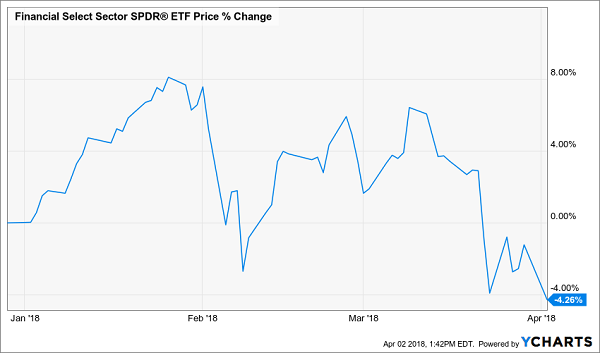 Toward the end of this article, I’ll reveal 3 funds chock full of high-quality, oversold stocks and yielding up to 6.4%. But first, let’s look at what’s driving this income (and gain) opportunity. It comes down to a glaring (and very temporary) disconnect in the market. 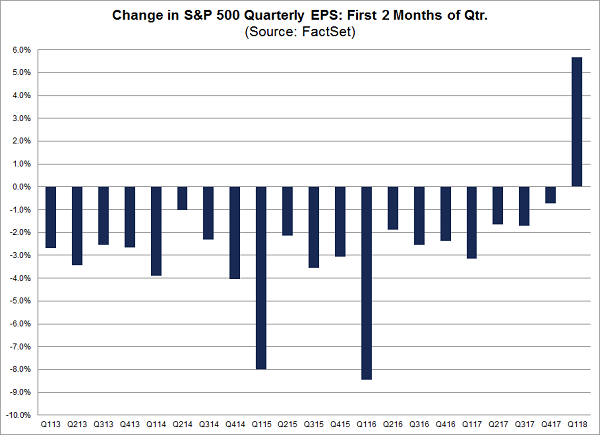 Less than a month ago, I showed you how the first quarter of 2018 saw an unusual anomaly: a sharp spike in earnings per share (EPS) growth for the first two months unlike anything we’d seen before. These gains happened across the market, and no sectors saw significant declines. More recent data confirms that things look great for stocks. 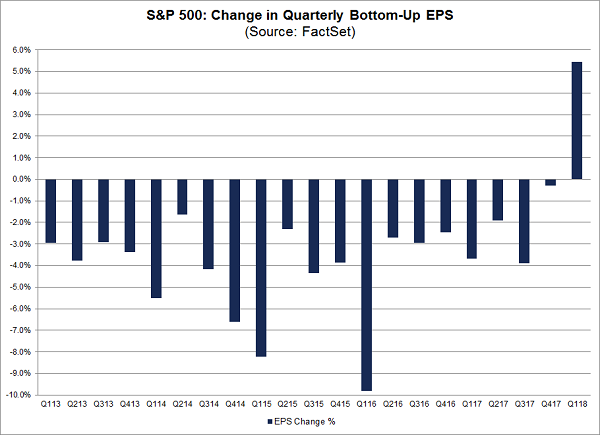 On March 29, just before the market took another turn south, FactSet released a report noting that the median EPS estimate across all S&P 500 companies in the first quarter of 2018 rose by 5.4%, which is pretty much identical to what we saw through the first two months of Q1. The biggest winners were energy (up 14.6%), telecom (up 14.1%) and finance (up 11.3%). Of course, there’s more to the story. Wages are up, inflation is moderate, and consumer sentiment is strong. So why is the S&P 500 doing this? The simple reason is that first-level investors are focusing on passing headlines that will be forgotten in a couple weeks. But as we’ve seen since the start of the year, all the scary headlines—about a potential war with North Korea and tariffs, for example—are quickly forgotten, and then stocks swiftly recover. That’s about to happen yet again, and savvy investors should be ready. We’re seeing a huge gain in financial stocks’ earnings, in no small part due to the Federal Reserve’s interest rate hikes in recent years, and its plans to raise rates 3 times (or more) in 2018. This is good for banks because higher rates mean bigger profits from lending money to Americans. It is also good for banks because the Fed only raises rates when economic growth is strong. And economic growth means declining delinquency rates, bankruptcy rates and, you guessed it, even more profits for banks. 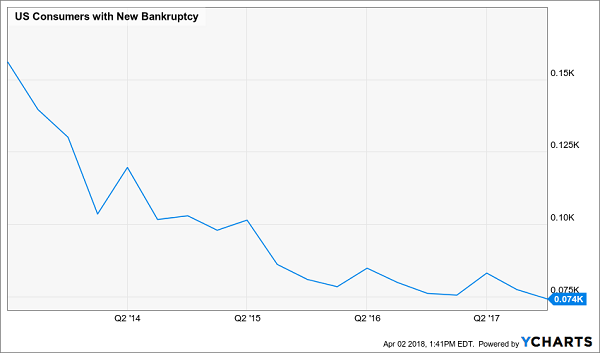 The total number of bankruptcies is crashing, and we’re also seeing default rates for mortgages and consumer credit fall to the floor. That means it’s bargain time for savvy contrarians. The only problem with XLF is that it yields a crummy 1.9%. We can do better than that. The John Hancock Financial Opportunities Fund (BTO) is chock full of high-quality, well-managed banks that are most exposed to Americans’ improving financial well-being. I’m talking names like JPMorgan Chase & Co. (JPM), PNC Financial Services Group (PNC) and M&T Bank Corp. (MTB), the kind of regional and national banks that are focused on providing Americans with mortgages, credit cards and other loans while also maximizing their own returns to shareholders. Plus, BTO pays a much better, yet still sustainable, 4% dividend yield. 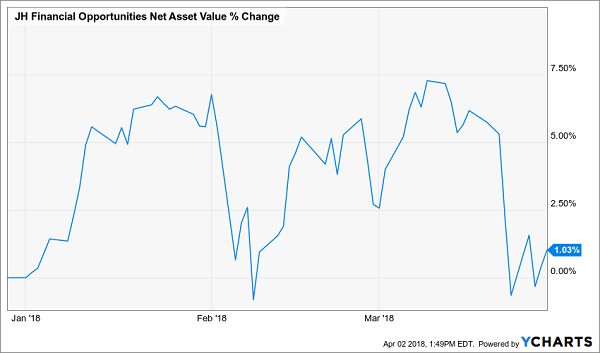 Here’s the best part: BTO’s net asset value (NAV, or the market value of all the fund’s portfolio holdings) is up 1%, while XLF is down 4.3%. Being up when the market is down tells me BTO is well managed—and is set to soar when investors realize just how oversold financials are. 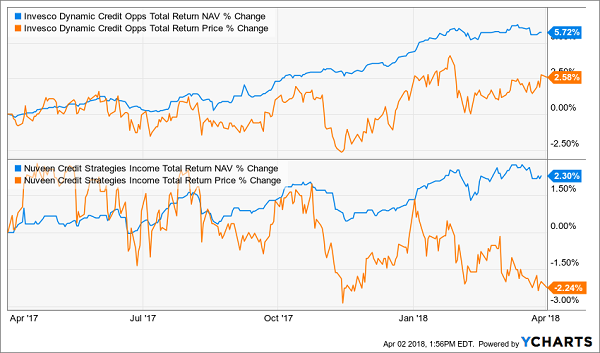 As strong as BTO’s prospects look, I would be remiss if I didn’t mention two other funds: the Nuveen Credit Strategies Income Fund (JQC) and the Invesco VK Dynamic Credit Opportunities Fund (VTA). 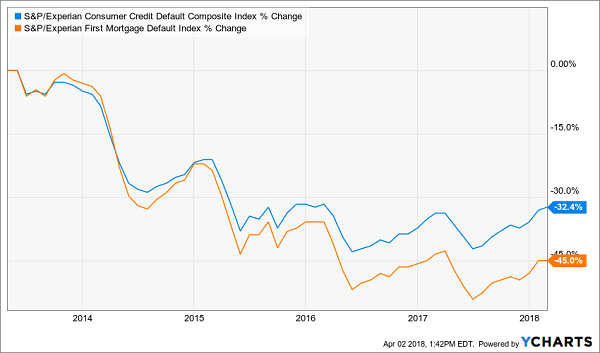 Both of these are senior-loan funds, and the way they work is simple: they leverage their NAV at a fixed rate, then lend that money out in the form of corporate loans with floating rates. This is important because the rate that debtors pay on floating-rate loans goes up when interest rates go up. And we all know what the Fed is planning to do this year: make interest rates go up. That’s why both of these funds are attractive right now, and their 6.4% (for VTA) and 6.2% (for JQC) yields make them even more enticing. This makes no sense because, as we all know, the Fed is going to make these portfolios more valuable. Amidst the panic selling, the market is giving us a gift of extremely oversold funds that are worth getting right now. Take advantage of the sale while you can! VTA, JQC and BTO are a special type of fund called a closed-end fund, or a CEF. 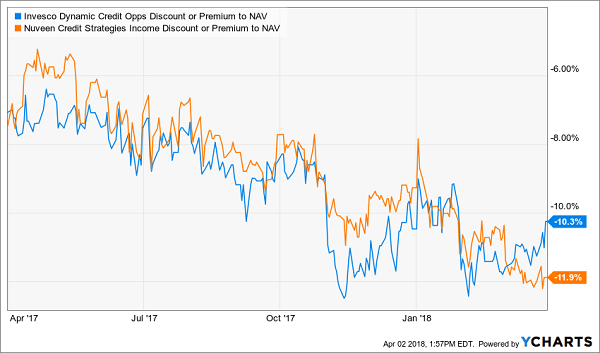 The key thing to know about CEFs is this: many of the 500 or so CEFs out there trade at discounts just as big, or bigger, than the markdowns these 3 funds sport. And those ridiculous discounts fuel their outsized dividends, too! 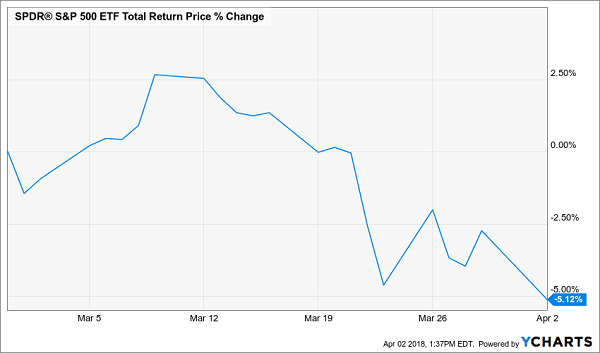 Take VTA, whose $0.75 annual dividend (paid monthly, no less) amounts to a 6.4% yield on its (tremendously discounted) market price. That sounds high—maybe even too good to be true. But the number that really counts is the yield on NAV, or the fund’s “true” value. And that comes out to 5.7%, a figure that’s much easier for management to earn. But millions of investors have totally missed this powerful advantage, casually dismissing CEFs’ discounts as unsustainable. That’s our cue to pounce. We’ll start with the 4 incredible funds I just named in a new FREE report I’ll GIVE you when you CLICK HERE. These 4 off-the-radar CEFs invest in real estate, corporate bonds and US and international stocks. Throw them together in a single portfolio and you get unbeatable diversification—which keeps your nest egg safe—and an average dividend yield of 7.6%, with the highest-yielder among them throwing off a fat 8.1% CASH payout! That’s just the start, because all 4 of these unsung cash machines trade at BIG discounts to NAV. Translation: You’re looking at easy 20% upside—at least—in the next 12 months as those weird discounts revert to normal. That’s on top of the 7.6% average yield you’re getting, too! Don’t miss this opportunity to tap the explosive dividends and HUGE gains only CEFs can deliver. CLICK HERE to grab your FREE Special Report and uncover these funds’ names, tickers and my complete research now.